With Facebook announcing Instagram Video, the tech companies seems to have pulled its socks and swung into action. Barely hours after Instagram Video was announced Twitter started sending emails of advantages and features of 'Vine' to users. And barely half hour after that YouTube has updated its app for both iOS and Android with InVideo Programming and Call-to-action overlays for content creators. Both these features aim to make watching videos on YouTube a better experience for both viewers and creators. I am not suggesting in anyway the YouTube update is linked to the Instagram Video launch, but the way things are looking, it has made videos a red hot commodity. First of the features is the InVideo Programming tool. This tool was already available to PC users and has now been brought to iOS and Android by YouTube. InVideo Programming tool feature shows a small screen within your video screen, which prompts you to check out another video. YouTube content creators can use this tool to get users to check out another video from their channels, driving your own views and subscribers base up. 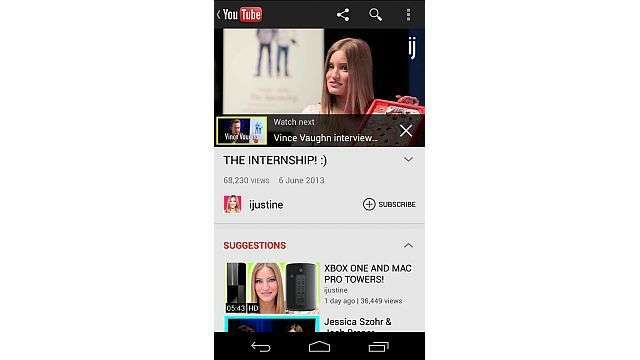 YouTube will make InVideo Programming feature available on the mobile website in future. The videos selected by them on the desktop version of the service will show up on the mobile version too. Second feature is Call-to-action overlays which can be used by video uploaders to share more information about their video to raise interest for their channels or their websites. These overlays are currently available for advertisers in AdWords for videos, but YouTube says that it is working towards making it available for all channels later this year. Besides this two talked about features the update has also brought about closed captions for live streams and several stability improvements, including fix for app crashes. So to download this must have updated YouTube version head over to the Apple Store for iOS devices and Google Play for Android devices. Have fun YouTubing!! !